Starokyivska Hora [Старокиївська Гора]. 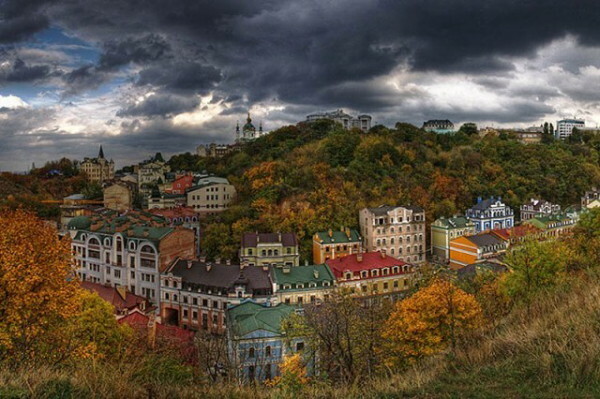 A historically significant area of Kyiv, situated on the plateau between the Dnieper River and the Lybid River and the Khreshchatyi ravine, with an area of about 80 ha. It was settled fairly early in history (late Paleolithic Period), probably because of its naturally protected setting. The northwestern section is purported to be the site of the so-called Kyi’s city, established in the late 6th century. By the late 10th century the hill was the location of the upper town, known as Volodymyr the Great’s city (approximately 8 ha), where the prince’s palace and the Church of the Tithes stood. In the 11th century all of Starokyivska Hora was settled as the upper town expanded and the city of Yaroslav the Wise was built up. It was encircled by high ramparts, which were 3.5 km in length and were studded with towers and gates. The Golden Gate, the Saint Sophia Cathedral, and Saint Michael's Golden-Domed Monastery were among the notable structures of the period. The district was almost completely destroyed by the Tatars in 1240. A partial reconstruction of it was effected in the 17th century, and since the 19th century it has been known as the Old Town district of Kyiv. In 1945 it was declared a historical Preserve.